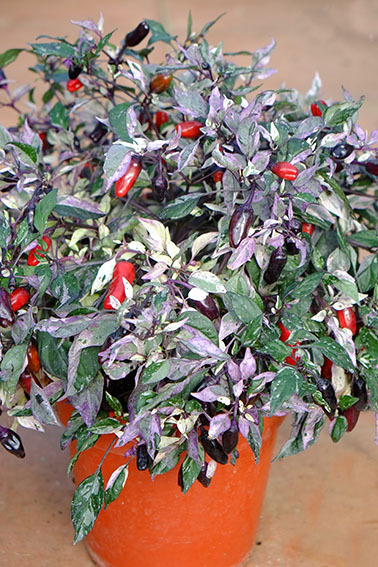 A colourful chilli that looks stunning on a windowsill or in a conservatory or greenhouse. The stems are drenched in purple, while the variegated leaves are vibrant with patches of green, purple, pink and white, and the decorative flowers are bright purple. The cone- to oval-shaped fruit measure 12 x 25mm hang downwards, and turn from deep purple (almost black) to red. But don’t be fooled by Calico’s attractiveness: the fruit are hot enough to make a scorching curry that will satisfy the needs of all but the most demanding chilli-head. 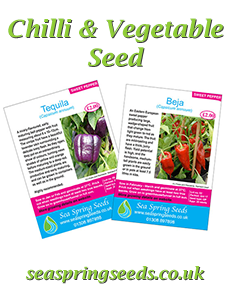 When grown in a 13cm pot, the well-proportioned plants grow to around 35cm high with a spread 25cm wide. In bigger pots the plants will be larger.